This LO was inspired by one at 2 Peas in a Bucket. 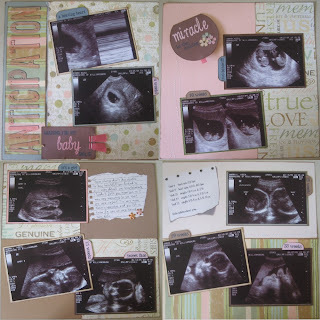 I was so lucky to have quite a few ultrasound pictures. I had tried to do them earlier with some more of the rub-on words from Making Memories, but they just seemed blah. The inspiration LO got me looking for strips & dots and gave me the inspiration title. These pages all have Iva's pictures on them, but I'll have similar pages for Alena's book.